Mix the flour, sugar, and salt in a large bowl. Add 2 tablespoons of the butter. Blend in a mixer until dough resembles coarse cornmeal. Add remaining butter; mix until biggest pieces look like large peas. Dribble in the water, stir, then dribble in more, until dough just holds together. Toss with your hands until you can roll dough into a ball. If dough looks dry, you can add a little more water. Flatten into a 4-inch-thick disk; refrigerate. After 30 minutes, remove the dough and let it soften so it’s malleable but still cold. Smooth cracks at edges. On a lightly floured surface, roll into a 14-inch circle about 1/8 inch thick. Dust excess flour from both sides with a dry pastry brush. Place dough in a lightly greased 9-inch round tart pan, or simply on a parchment-lined baking sheet if you wish to go free-form, or galette-style with it. Heat oven to 400°F. Overlap apples on dough in a ring 2 inches from edge if going galette-style, or up to the sides if using the tart pan. Continue inward until you reach the center. Fold any dough hanging over pan back onto itself; crimp edges at 1-inch intervals. 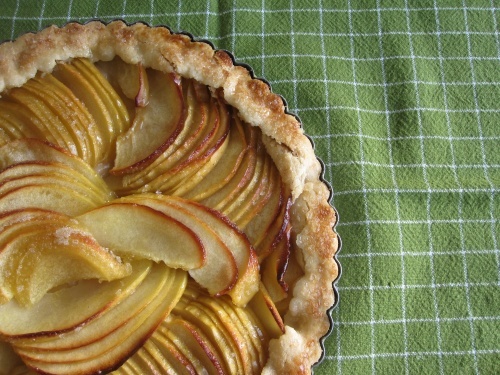 Bake in the center of oven until apples are soft, with browned edges, and crust has caramelized to a dark golden brown (about 45 minutes), making sure to rotate tart every 15 minutes. Put reserved peels and cores in a large saucepan, along with sugar. Pour in just enough water to cover; simmer for 25 minutes. Remove peels and cores using a slotted spoon, ensuring there is only liquid in the glaze. Remove tart from oven, and slide off parchment onto cooling rack. Let cool at least 15 minutes.